Learn TIG welding, an arc welding process that uses non-consumable tungsten electrode to produce the weld. You will learn metal and joint preparation, use of filler rod andTIG specific welding skills. TIG welding produces more precise, cleaner welds resulting in less cleanup of your weld, and is useful when working with panels, sheet metal and lighter materials. You will practice your new skills under supervision to create a piece of wall or yard art from sheet and scrap metal. Learn to illuminate your clothing, art, bike or yourself! You will learn about EL wire and LED lighting and their different uses. You will learn where to best connect lighting to objects and closthing, how to attach the lighting, and how to reduce battery size for the object. Bring along a costume, article of clothing or any art piece and you will leave with an illuminated piece. 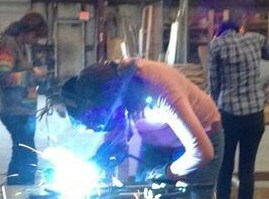 Learn to cut metal using an oxy-acetylene torch and plasma cutter. You will learn the safety practices with these tools and their gasses and then will practice with the cutters and cut a design into metal to create a piece of yard or wall art using found metal pieces. Safety gear provided. This project - the art vehicle build and associated workshops - has been generously funded by a grant from the City of Houston through Houston Arts Alliance. This hands-on class for teens will expand upon everything learned in Welding I and provide the opportunity to build a small wall or yard sculpture. You will practice with the tools and MIG welder learned in Welding I and will learn basic fabrication techniques in creating your art piece or in joining our art vehicle apprentices in practicing on an art vehicle in progress. Materials will be steel and/or found metal - feel free to bring your own metal pieces if you have something specific you'd like to create. Safety instruction and safety gear included. This class is for teens 13-18. Pre-requisite is Welding I or equivalent experience. Requires registration and waiver signed by a parent or guardian. Please wear solid closed-toe shoes, jeans or workpants and long sleeved shirts. A bandana or sock hat to wear under the helmet is optional. You garments should be OK to potentially damage. FREE to ArtX Members. $15 non-member cars/ $10 scooters/ $5 bicycles. We will be participating in a group project every Tuesday evening through June. Join us to practice your metal arts skills! Not just for women, novice dudes can come along as well! 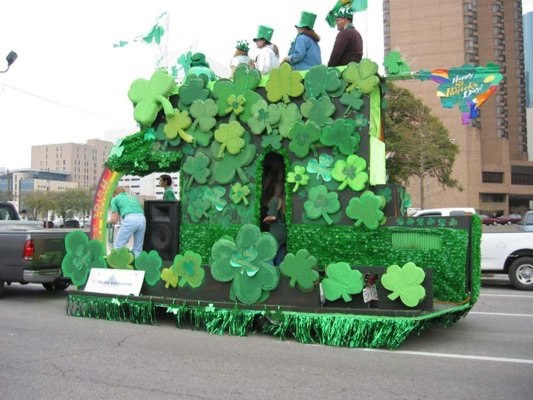 Join us to roll in Mardi Gras Galveston's Krewe D'iHeart Media Art Car Parade - a tradition on the Strand! Art Cars receive a case of beads for 1, entry to the strand and gas money. ArtX members will also receive Saturday balcony tickets. FREE to all! Registration required.